! Notice: We have decided to discontinue the NotifyService™, although we will continue to maintain the service for existing customers (and obviously continue to support and advise those customers). Therefore the NotifyService™ is no longer available as an option in the application form. You’re also welcome, of course, to phone or e-mail us with any questions you may have, or for legal or practical advice about how to change your name or how to use your deed poll. We are also looking at releasing some parts of the NotifyService™ on our website in the near future as free services open to everyone. We’re the only deed poll service in the U.K. that also provides a notify service to help you with this second step — the task of updating all your records and official documents to be in your new name. 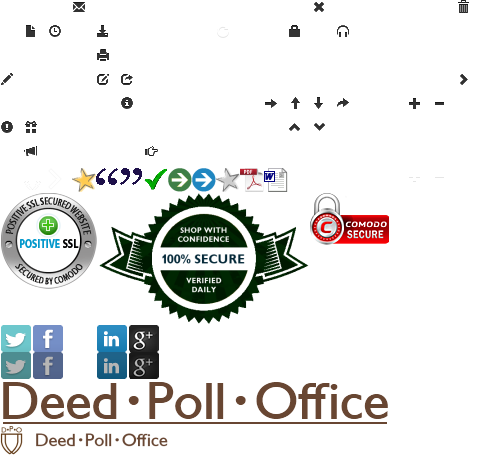 For each service / organisation you want to update with your new name (e.g. 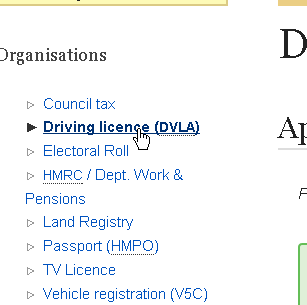 your driving licence, or National Insurance records) there’ll be a certain process that has to be followed. In each case, we know exactly what that process is, and we actively help you complete it (for each service / organisation) as quickly and easily as possible. You simply need to log in to your NotifyService™ account, select the service you want to update, and then we’ll guide you through it. With some services (e.g. HMRC, TV Licensing) your records can be updated electronically, meaning we can securely submit your change of name details to that organisation, on your behalf. You’ll then get a confirmation from the organisation directly. For other services (e.g. the electoral roll, HM Land Registry) you’ll need to complete certain forms or other paperwork, and then post them to that organisation. We’ll automatically generate these forms as pre-filled PDF documents, ready for you to print out, sign, and send. 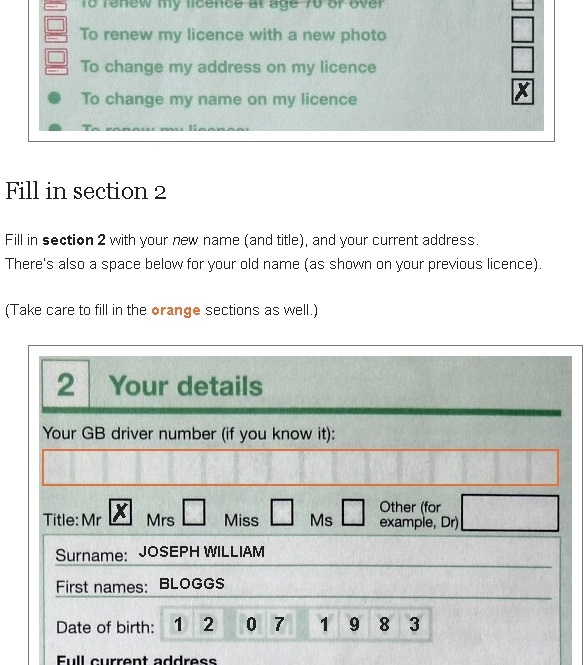 To update your driving licence or V5C vehicle registration certificate, you’ll need to fill in a (paper) application form and post it to DVLA. 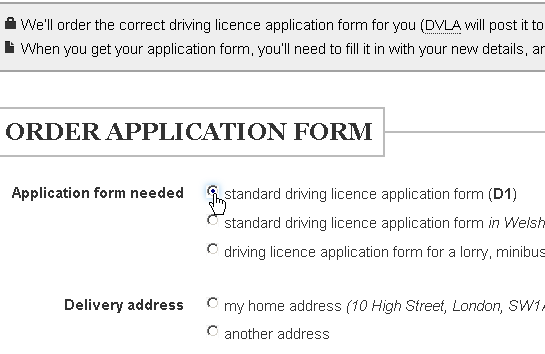 For your driving licence, we’ll order the right application form for you (DVLA will post it to you for free). In each case, we’ll show you, step-by-step, exactly how to fill in the whole form (with pictures, showing the correctly filled-in data). We can securely submit your passport application details to HM Passport Office electronically, on your behalf. HM Passport Office will generate a declaration form which you’ll need to sign and send back to them, along with your deed poll and other supporting documents. For any service or organisation which doesn’t have an application form (or other formal procedure) for updating your records (e.g. council tax, or private organisations and companies), we’ll generate a fully typed-up cover letter, ready to print out, sign, and send (with your deed poll). We work out what kind of application you need to make, and from that, we can tell you which sections you must fill in, and which ones can be left blank, and so on. It often happens that your address might need updating (at the same time), or you might have lost your licence, or you might need to exchange a foreign licence — we take all these kinds of things into account too, and give you the right instructions. For any other service / organisation, we’ll generate a fully typed-up cover letter which you can send with your deed poll, to tell them about your change of name. If you hold a Biometric Residence Permit (BRP), you’ll also need to update your BRP to be in your new name. However this is not included in the NotifyService™ — you’d need to apply yourself, although we can certainly help you by answering any questions that you may have about it. 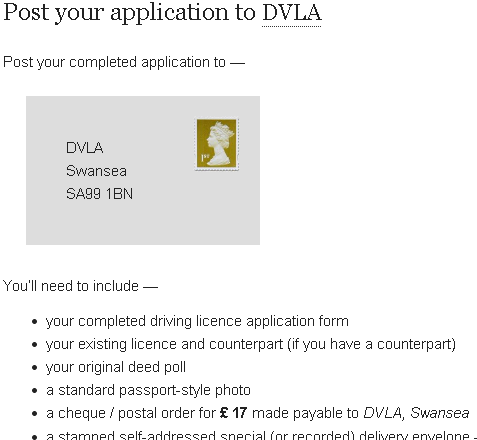 At present, we only support official organisations which cover England & Wales (such as DVLA and HM Land Registry) or the U.K. as a whole (such as HM Passport Office and HMRC). We take security very seriously. We use a layered approach to security (also called “defence in depth”) — meaning we combine many different practices at different levels to secure your data and mitigate threats. We will never pass on your data to any 3rd party unless you specifically instruct us to (through your use of the NotifyService™), or we’re required to by law. We keep data for as long as it’s needed (in order to update your records) — and then we carefully destroy it. Destroying data after it’s been used is one part of mitigating the threat of it being stolen or lost. Destroying your data is not a simple matter, and (as with our approach to security generally) we take it very seriously. For a single application, the NotifyService™ is £ 28.00.